The tower is situated behind the Pisa Cathedral and is the third oldest structure in the city's Cathedral Square, after the cathedral and the Pisa Baptistry. The tower's tilt began during construction in the 12th century, caused by an inadequate foundation on ground too soft on one side to properly support the structure's weight. The tilt increased in the decades before the structure was completed in the 14th century. It gradually increased until the structure was stabilized and the tilt partially corrected, by efforts in the late 20th and early 21st centuries. The height of the tower is 55.86m (183.27 feet) from the ground on the low side and 56.67m (185.93 feet) on the high side. 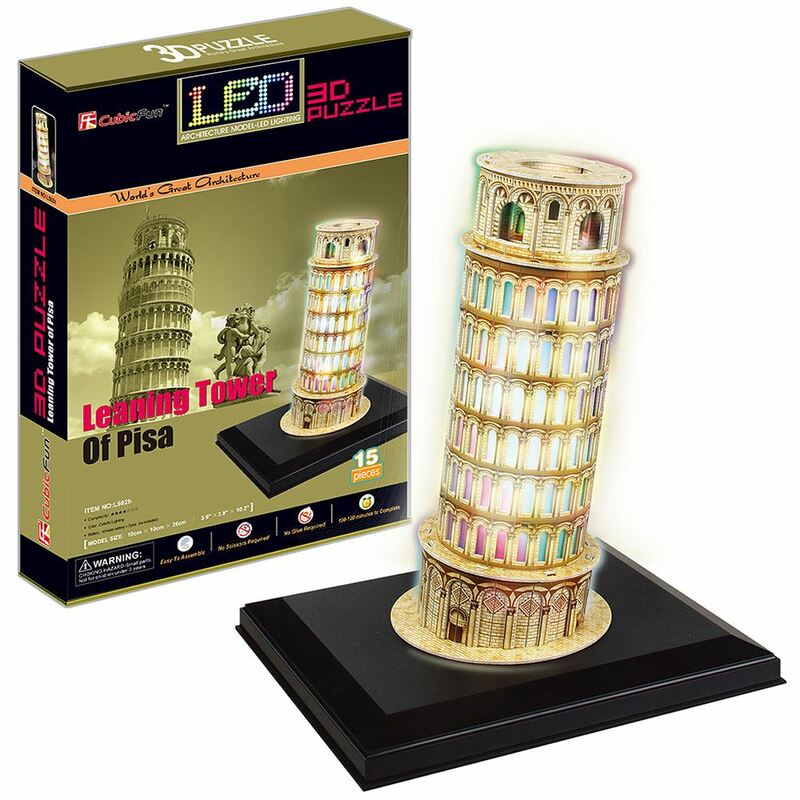 This puzzle comes with a decorative LED lighting plastic stand, which you can sit the completed puzzle on top of and watch it light up! This 3D Puzzle is made of paper and expandable polystyrene foam board, it is easy to assemble without the use of any other tools or glue. No of Pieces: 15 Model Size: 10cm x 10cm x 26cm. Age: 8+ years.